This book review originally appeared at Team Cartwright blog on October 13, 2016. I remember it vividly- I was finally pregnant, and I happened to be at Target. I thought I’d stop by the book section and get a few pregnancy books. I couldn’t wait to read about the bundle of joy inside of me. I love knowing facts and details. I bought two books. One of them was What to Expect When Expecting (an amazing book). The other book, I returned so fast, I don’t even remember the title. It was the most negative book I’d ever read. It detailed every possible thing that could go wrong during pregnancy, along with all of the things I needed to avoid, etc. It was not something I wanted to read. I am all about knowing the facts, but I am also focused on staying positive and realistic. As the book was written it simply put unneeded and unwanted worry on expecting moms. When I returned the book, I also returned to the pregnancy book aisle. I found that many of the books focused on the negatives. So, I stuck with the one good book I’d found and did the rest of my reading and research online. About a month before my due date I realized I should probably start reading up on my baby, instead of just the pregnancy. 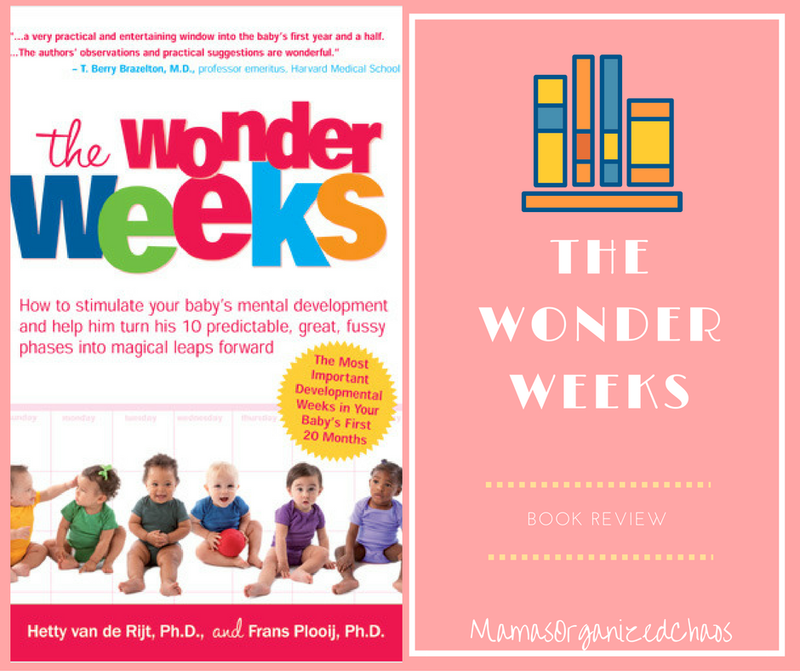 I found two phenomenal books: Babywise, and The Wonder Weeks. I’ve decided to start doing book reviews of the helpful books that I find. So, today I’ll be starting with The Wonder Weeks. The Wonder Weeks concept and idea is just fascinating to me. This book outlines 10 developmental milestones that occur in a baby’s first 20 months of life. The idea is that these developmental milestones actually occur at roughly the same time for babies (within a few weeks). With predictable leaps in babies development, this book is incredibly eye opening as a parent. The book details the earliest week that these leaps typically occur. You can literally look at a calendar and predict when they will occur for your child. During these leaps, your baby is extra fussy as they work through these life altering changes that are occurring in their brains. When the leap is over you’ll be able to see your baby showing new skills! I found that the app coupled with the book was an amazing combination. I detail below what each has to offer. The combination put my mind at ease. All of the sudden (literally out of the blue) Caroline would be extra fussy, and I had no idea why or what had changed. Without fail, 100% of the time, I would check the wonder week calendar, and Caroline would be entering or already in a leap. It was shocking to me how predictable these leaps really were! Once I realized that Caroline was in a leap, I’d read the chapter for that specific leap in The Wonder Weeks book. Reading about the skills she was developing put everything into perspective and allowed me to remove myself from the frustration of the “fussy period”, and be more understanding that it wasn’t my fault or her fault or anyone’s fault…it was a normal mental development that was occurring. I was also able to read about the new skills that might be popping up, and see them happening right before my eyes. Truly amazing. Once I realized that the concept of this book seemed to really be on point, my husband and I would read about the next leap ahead of time so we knew what skills we were looking for. We enjoyed reading the chapters together every evening, and discussing our daughter’s progress. I think the app is now $1.99. It is the ONLY app I’ve ever paid money for, and I would do it again in a heartbeat. The app is a quick reference to keep tabs on where your child is in their developmental cycle. You can enter your child’s birth date and track where they are in relation to the leaps that are outlined in the book. The app gives a quick summary of the skills that may be developing during this leap. I used the app mostly for the ease of the calendar and tracking. 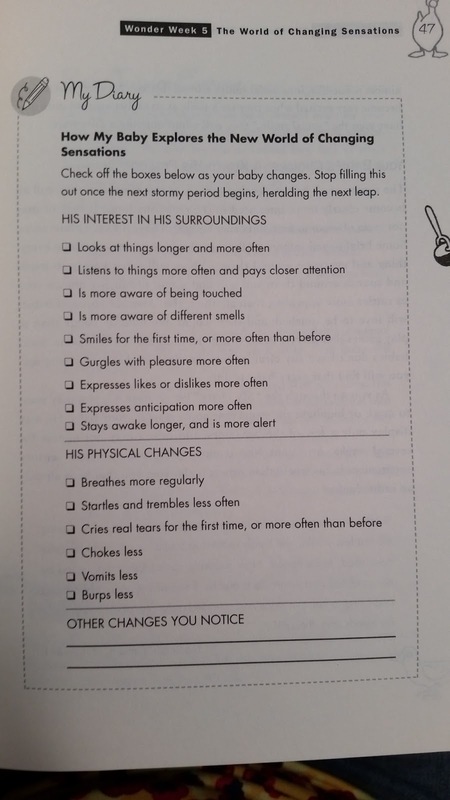 The book suggests to base your child’s development based on their due date. I entered 2 “children” into the app: Caroline based on her due date, and Caroline based on her birth date. I always found that my daughter entered leaps perfectly based on her birth date. I tracked them both for about 6 months, and once I realized our trend to be based on birth date, I stopped tracking based on due date all together. I’d recommend doing this to see how the calendar lines up for your specific child. The book is a must buy. It goes into a ton of detail about what is happening with your baby’s development. This Week’s Fussy Signs: This section outlines what behaviors and clues to look for indicating that your baby is about to make a developmental leap. There is a diary section where you can check off the signs you’ve noticed to help you keep track of things. The Magical Leap Forward: This section discusses the new skills and abilities your child may acquire during the leap. Again, there is a diary section with a checklist . This was probably our favorite part of the book! We loved reading about all of the new skills that our baby would soon acquire! What You Can Do to Help: This is an amazing section, that gives you ideas for games, toys, and even focused activities that are catered to each stage of development. This is also one of my favorite parts to read through and gave me some great ideas! After the Leap: After the leap, your baby will start to be happy, and more independent again. This section lets you know when to expect this. The chapters also have real life experience quotes from moms and dads, along with fun facts on things like brain changes, sleep tips, top toys, and more! As an example, in wonder week 12, there is a brain change fact that states “At approximately 10 to 11 weeks, the head circumference of babies dramatically increases”. I just loved seeing everything put forward in such a positive light with lots of fun facts. Babies have a lot of ups and downs and it can be hard on parents when they don’t know what’s going on. This book really does help you to understand what’s happening in your baby’s development and how you can assist to make things easier on them. I highly recommend grabbing a copy! We’ll even be re-reading this when baby #2 comes along one day- it was that interesting and there are way too many facts to simply remember for the next go around. It is definitely an in the moment read and well worth your time (even when sleep deprived)! Check out my other book reviews here. And you can view all of my personal experiences with the different leaps and wonder weeks by going to this link! Next Post Friday Finds- The Microscope for Toddlers!